In this post, you will find everything there is to know about the Software updates for Fire Emblem Echoes: Shadows of Valentia on the Nintendo 3DS (originally released on April 20th in Japan, and May 20th in Europe and North America). 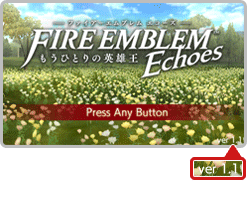 How to download updates for Fire Emblem Echoes: Shadows of Valentia for the Nintendo 3DS? A presentation issue that occurred in the 4th set of DLC has been fixed. Additional notes: this update fixes the missing voice acting for the support conversations from the “Rise of the Deliverance” DLC Pack (Lukas x Forsyth, Lukas x Python, and Clair x Mathilda), which was missing for some users. A big thanks to norfy for the heads up about the support conversation voices!